Designed by Helen Nelson in 1918, an easy table runner is constructed from a ﬁlet crochet insertion, fabric, and a wide edging for the ends of the table runner. The insertion, made in strips, would make a lovely bedspread, using the edging for a border. Simple stitches and a simple pattern, combined with negative space, make for an elegant insertion and lace edging. 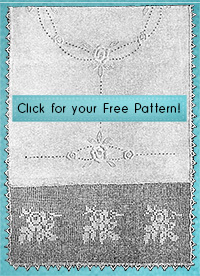 Designed by Edward Ellis Ford in 1921, you can use this pattern to make wonderful embellishments for garments and linens.